Students should be prepared to discuss the election of 1960. They should know who the other candidates are for the Democratic nomination (Humphrey, Johnson, Stevenson) and the Republican nomination (Richard Nixon). Spend a few minutes discussing JFK's youth and political resume to provide context for this discussion. Remind the students that the young senator has not been tested as severely as his leadership will be tested by the civil rights and Cuban crises of his presidency. Students will learn to read and interpret primary documents critically. Students will learn about the political styles and strengths of two of America's most important leaders during the 1950s and early 1960s. Students will examine the issue of money in American politics. Students will examine the issue of fair play in American democracy. Divide the class in two and ask them to use the questions to prepare for a debate between a group taking ER's side in the argument and a group taking JFK's side. Why is JFK angry with ER? Do you think he is justified in being angry? Why or why not? What specifically is JFK referring to when he says: "I know of your long fight against the injudicious use of false statements, rumors or innuendo as a means of injuring the reputation of an individual"? Do you think ER is guilty in this case of the practice against which she has fought? 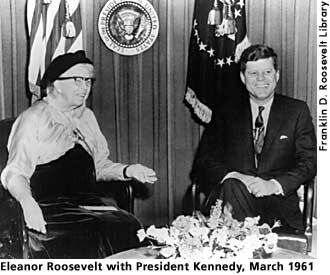 JFK is not satisfied by ER's column of January 6, 1959 in which she quotes from his letter to her of December 29, 1958. Why isn't JFK satisfied? Do you agree with him? Why or why not? In her letter of January 20, 1959, ER offers to write another column. Why do you think JFK does not accept this offer? How would you characterize JFK's strategy in appealing to ER to substantiate or withdraw her charge? How would you characterize ER's strategy in responding? What can you conclude about ER's influence and power as a columnist and politician from this exchange? Do you agree with ER that "giving too lavishly may seem to indicate a desire to influence through money"? Cite a recent example in the press in which the spending of private money in a political campaign was an issue. In her telegram of January 29, 1959, what is ER implying by using the phrase "turn the other profile" rather than "turn the other cheek"? Why is this a pun? How would you describe ER's attitude toward JFK throughout this exchange? A recent attempt to achieve passage of a campaign finance reform bill in Congress. Do you think the spending of a candidate's (or his family's) fortune in a campaign should be limited? Do you think the amount of money a candidate can spend from any source should be limited? Why or why not? To read and interpret primary documents critically. To examine the tensions within the 1960 presidential election. To learn about the political power of the most significant American woman of the twentieth century, how she wielded it, and the dynamic of her relationship with JFK. The visit of JFK to ER at Val-Kill on August 15, 1960, after he received the Democratic nomination for president, is considered a critical meeting in JFK's drive to solidify support for his election. ER had hoped that Adlai Stevenson, whom she strongly supported for the presidency in 1952 and 1956, would again be the Democratic nominee. Mary Lasker, a good friend of ER's who worked for many of the same political and social goals, was a Stevenson loyalist, a Democratic Party activist, and a wealthy contributor to Democratic candidates. Anna Rosenberg was also a Stevenson loyalist. Chester Bowles, who had been governor of Connecticut and ambassador to India, was a friend and political ally of ER's. Bowles planned to resign from Congress to work for JFK and hoped to be given a role in a Kennedy administration. JFK appointed him undersecretary of state after he was elected. Judging from ER's "My Day" column and the exchange of letters between them after the meeting, what were the important issues they discussed? What was JFK seeking from ER at the meeting? What was she seeking from him? Why do you think ER is sharing her letter to Mary Lasker with JFK? Would it have been more or less effective for her to say what she says to Lasker directly to JFK? Why or why not? What political skills does ER demonstrate in this exchange of letters? Allida Black, Casting Her Own Shadow: Eleanor Roosevelt and the Shaping of Postwar Liberalism (Columbia University Press, 1996), 177-199. Lawrence Fuchs, "The Senator and the Lady," American Heritage, 25 no. 6 (October 1974): 57-61, 81-83.
with funding from the GE Fund through Save America's Treasures.